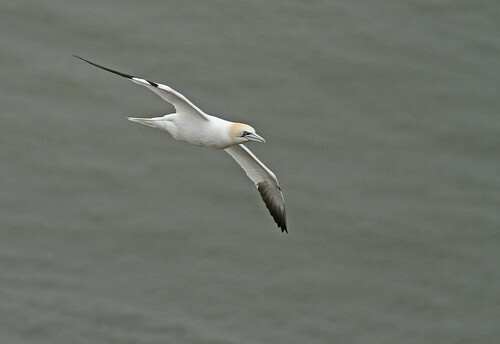 One of natures most splendid sights is the gannet in flight. It is a diving seabird and I believe it’s one of the worlds biggest divers. They are 94cm long with a wingspan of 174cm and they dive for fish from an average height of around 25m at speeds of up to 100km/hr (60miles/hr)! They fold their wings back just before they enter the water and watching it from above the surface is absolutely breathtaking. 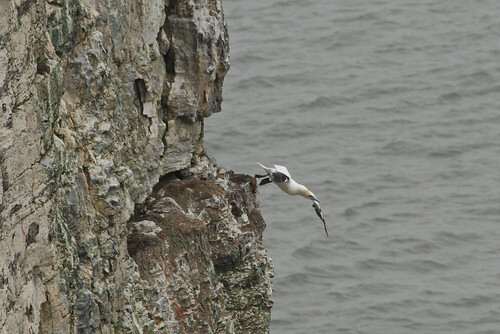 This particular gannet (Morus bassanus, Dansk: sule) landed on a ledge a couple of hundred feet up the cliff face at Bempton in East Yorkshire. The top of the cliffs is an RSPB reserve and it’s one of my favourite places to be. On the particular day I was there – February 13th – it was ferociously cold. I was well wrapped up, the air temperature was about 1 degree C, but the killer was a fierce offshore wind howling across and causing a lot of windchill. The birds didn’t seem to mind it though. I really like this sequence of events and the rocky ledge so high off the water was the perfect place to capture it! 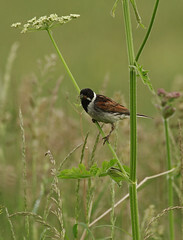 There’ll be more from Bempton and that part of the world in the near future. 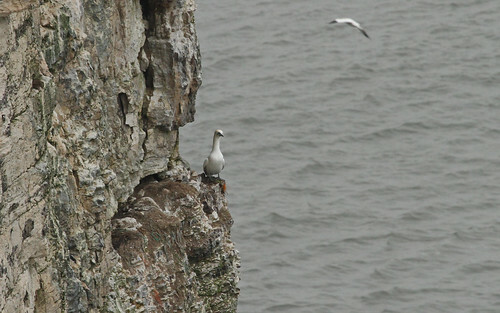 This entry was posted in Bempton, Birds, Ornithology, Seabirds, UK wildlife and tagged Bempton, diving seabirds, gannet, Morus bassanus, RSPB Bempton Cliffs, sule. Bookmark the permalink. What a wonderful set of pictures. You can really see the motion of the bird diving – fantastic! Indeed, I just wish it was in my garden! What a great experience it must have been to watch this big and special bird. The photos are very good, – and I am curious too, do yoy have any of the landing? 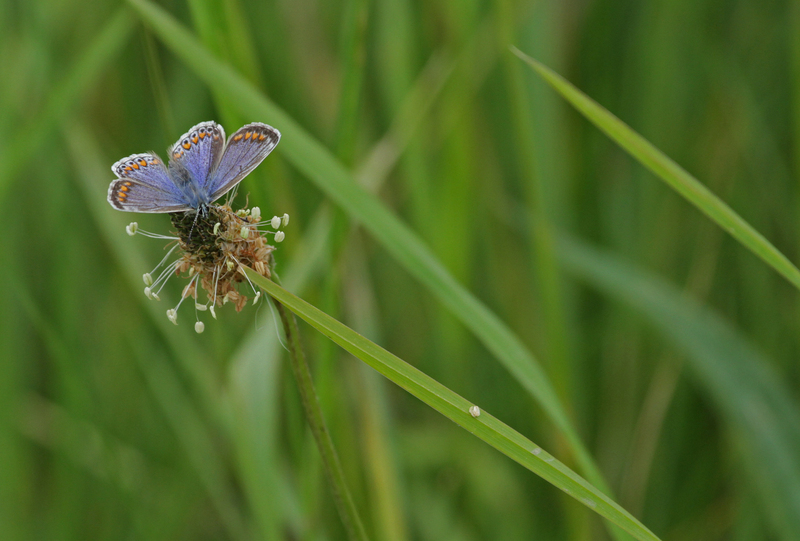 I do have a landing shot – I shall be posting it soon. Such beautiful birds! Very trip lines! Hey Terry, they are indeed beauties, I could watch them all day! Hello Fran, gannets aren’t the same as boobies but they are closely related. 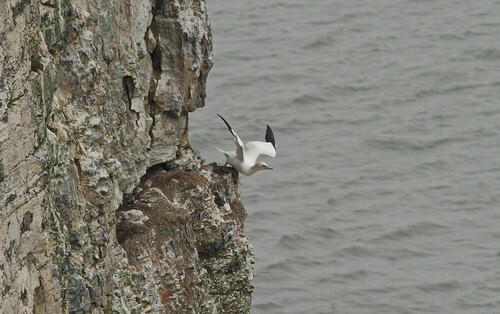 I’ve chuckled at them too when they land, but gannets land on cliff faces and they seem to be fairly accomplished at it, even in fierce winds. I do have a photo of one landing, stay tuned it’ll be in a post pretty soon. That’s a great story Fran 🙂 Are you going to post the picture? I’d love to see her. I’m looking forward to seeing Shelob. I told your story to my wife this morning and she shivered! Earlier in the week my seven year old son found a house spider around an inch across in his bedroom and he brought it down and threw it towards the good lady. Suffice to say that after she’d peeled herself from the ceiling she read him the Riot Act with some vigour. When she’d calmed down she explained to him that it was one of those irrational fears but she couldn’t help it, she simply can’t cope with spiders. To which the little monster replied with humbling compassion and understanding “If I’d known that I’d have put it in your bed”. 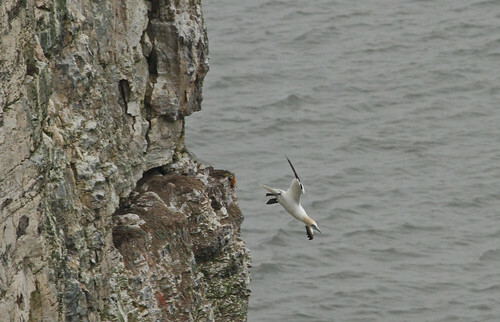 I couldn’t agree more, a diving gannet is a splendid sight! What always amazes me about them is how they keep their feathers so white, they always look immaculately turned out. Gannet feathers are incredibly white which is great because it means you can see them miles away, but it can also make photographing them tricky as they can overexpose even in relatively murky conditions. I guess you saw a lot of them during your time on the high seas. Fantastic photos! I admire your grit in withstanding the wind chill. Thanks Sue. It just had to be done, even though it was cold it was marvellous. And because it was so cold I had the whole place to myself, which made it even more bleak and beautiful. Superb sequence. Well done for braving the elements! With regard to the reference about children eating too much, I remember my older sister using that phrase with her children many times although I had never heard anyone else use it then – or since (until now 🙂 ). It was worth the chill! It looks like ‘Gannet!’ is used in several parts of the country. I wonder what the origin of that is. It looks cold and dangerous, and the sea that cold grey North Sea!!! Hello valerie, it was bitterly cold and the North Sea was very cold and very grey. Bizarrely though, we were up at Flamborough Head, a couple of miles south of Bempton, the next day and the clouds had cleared, the wind had dropped away completely, and we were running around in shirt sleeves! The notion of danger up there is illusory though because what the pictures don’t show is that the RSPB have erected a stout fence all the way along the top of the cliffs. Which suited my purposes perfectly because in the strong winds I wouldn’t have ventured close enough to the edge to get a lot of these photographs. But even with the fence it’s still a very exhilarating experience, espcially for someone like me who’s a complete wuss when it comes to heights. Hello Valerie, it is indeed a specialy place up there. We didn’t make it across as far as the dales on this trip, we were over on the east coast, but the whole of that part of the world is spectacular. Beautiful, I love gannets – they always remind me of The Rime of the Ancient Mariner, although I know it was actually an albatross he had hanging round his neck. I do believe spring is on its way. On the subject of albatross I got some great shots of fulmar, the closest we have to an albatross, while I was at Bempton and I’ll be posting those soon. The gannets are simply majestic, everything about them is exceptionally beautiful. 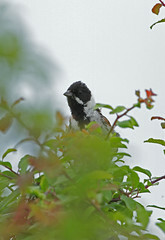 It was a few hours well spent despite the fearsome weather! As you well know, Finn, the gannet is one of my very favorite seabirds. I’ve been a fan for a couple of decades, and savor any chance that I may have to watch these magnificent fliers and fishers in action. I can very well picture you bundled up in the fierce winds and spending quality time with your camera. Love the cliff-takeoff sequence! Hello Gary, that’s exactly what I was doing! The wife and kids were huddled inside in the warm and I took the opportunity to explore on my own. 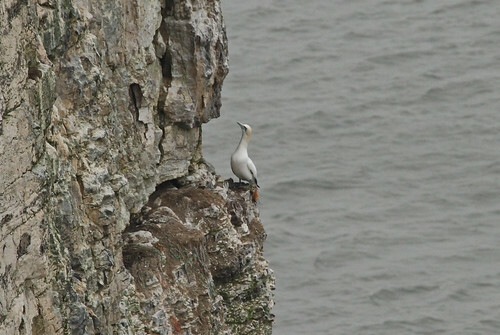 Where do you go to see gannets? I guess they’re some distance from where you are. 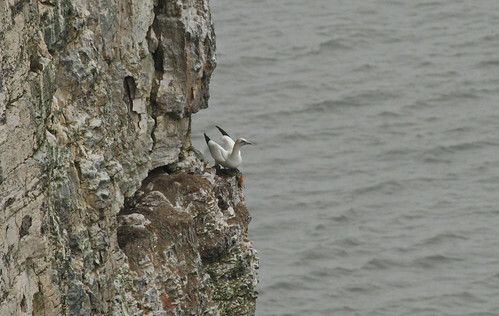 There’ll be other seabird posts from that part of the world in the near future including more on gannets. Thanks Gary, the Australasian version is very similar to ours, the black wingtips look more extensive than the northern gannet and the black tail feathers are absent in ours, but otherwise they look essentially the same. I like the NZ name for it too – the ‘takapu‘. Great shots Finn 🙂 I just love seabirds’ feathers, perfection in motion. I saw lots of gannets on a trip to the Scillies. And now i come to think of it my dad used to compare us children to gannets….swooping down on his dinner – when we’d already eaten!! We also used ‘gannet‘ as an insult when we were kids for someone who we thought ate too much. I was thinking of mentioning it in a post but decided not to because I thought it may be just us that used it in that way. But apparently not! Aren’t the Scillies a wonderful place? Especially if you like seabirds.